Bangle & Ring Making Machine (DF 13 /14) that we offer has longer functional life and comes with a strong body. We are named among the renowned Manufacturers, Exporters and Suppliers of Bangle & Ring Making Machine. We manufacture the machine using quality approved components and the latest techniques under the strict vigilance of experts. We conduct stringent quality tests on the machine so as to ensure that only the defect-free product reaches the customers’ end. The computerized and numerically controlled (CNC) machine is capable of generating various decoration on flat and convex (Oval) surface. The spindle is equipped with ceramic bearing of very high precision accuracies. The spindle has a maximum of 50, 000 RPM. The spindle is coupled with variable AC drive which gives flexibility to change the speed as per design requirements. The CNC controller is compatible with leading CAD / Cam Software available in the market. The programs are generated in (G) codes and (M) codes. The program can also be generated manually. All the machine components are machined on precision on CNC machine and are hardened and grounded. These components are idividually inspected for the accuries. The machine is assemble in a controlled environment. 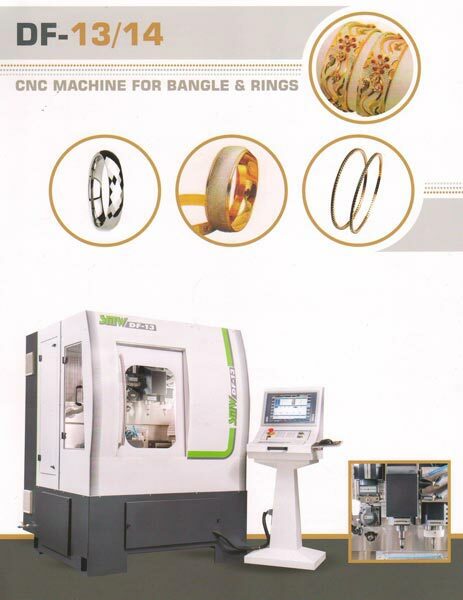 Centering System : Laser auto - Centering system for centering bangles. Automatic Z-Presetter for tool length.